It’s time for the annual Easter Monday Lent Madness post-game show with Tim and Scott. This episode celebrates the victory of Martha of Bethany, winner of the 2019 Golden Halo. You’ll also witness Tim messing up the intro but, well, it’s Easter Monday and he’s tired. Hence his drinking coffee out of a giant vat/vintage Julian of Norwich Silver Halo Winner soup tureen. Of course, there’s also product placement, namely the pre-ordering of the 2019 Golden Halo Winner Martha of Bethany Tenth Anniversary Commemorative Mug. Get yourself a mug for only $11 and sell it on eBay later for millions, if not billions. You are also reminded that there are limited quantities left of the 2018 Golden Halo Winner Anna Alexander Mug and the 2016 Golden Halo Winner Dietrich Bonhoeffer Pint Glass. And…going somewhere? Who could forget the Lent Madness Travel Mug? But that’s not all. Nope, your last gasp of Lent Madness 2019 also includes a preview of Nominationtide, the ONLY window when the Lent Madness public (that’s you!) gets to suggest saints for the upcoming year of the Saintly Smackdown. Look for this brief but exciting period coming up later in Eastertide. The Supreme Executive Committee of Lent Madness congratulates Martha of Bethany for winning the 2019 Golden Halo. Martha became the 10th saint to wear the golden crown by defeating the inspiring runner up Pandita Ramabai. She joins previous Golden Halo winners George Herbert (2010), C.S. Lewis (2011), Mary Magdalene (2012), Frances Perkins (2013), Charles Wesley (2014), Francis of Assisi (2015), Dietrich Bonhoeffer (2016), Florence Nightingale (2017), and Anna Alexander (2018). To help celebrate Martha’s victory, we’ve invited the creative geniuses who have shared their talents throughout this holy season to honor the Golden Halo winner. We’re delighted they answered the call! 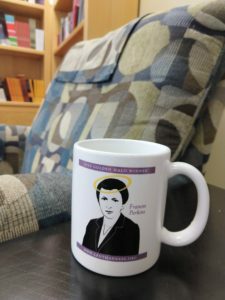 Last week, the Supreme Executive Committee of Lent Madness announced that we would be giving away three free mugs featuring 2013 Golden Halo winner Frances Perkins. These are precious collectors’ items, and it’s possible the winners will sell their mugs for a golden fortune. To enter, people were invited to like and share a post on the Forward Movement Facebook page, and the winner was chosen randomly. We are pleased to announce that the three winners are Christine Mills, Michelle Crull, and Susan D. Amussen! Soon they’ll be enjoying their coffee (which some have called “satan’s drink”) or tea out of rare, union-made mugs. 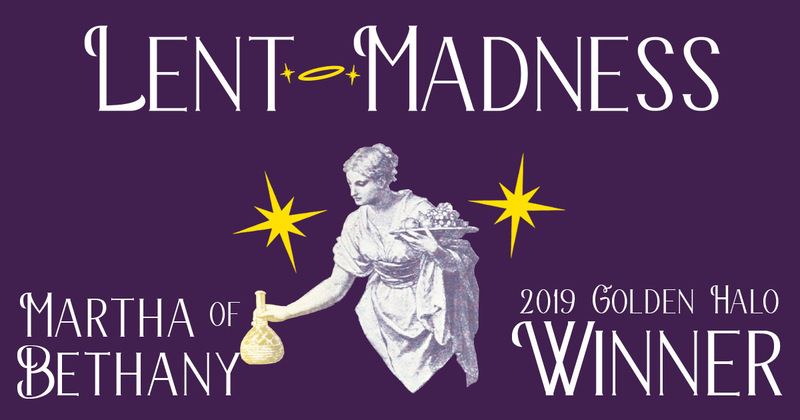 Speaking of collectors’ items, if you want to get an early start on expanding your own collection, it’s not too early to pre-order your 2019 Golden Halo winner Lent Madness mug. It will feature the winner of this season’s epic competition, the tenth anniversary year and first-ever all-woman Faithful Four. Be the envy of your friends as you enjoy your favorite warm beverage later this spring or early summer, when the all-new mug ships. It will feature Martha, Pandita, or Zenaida. 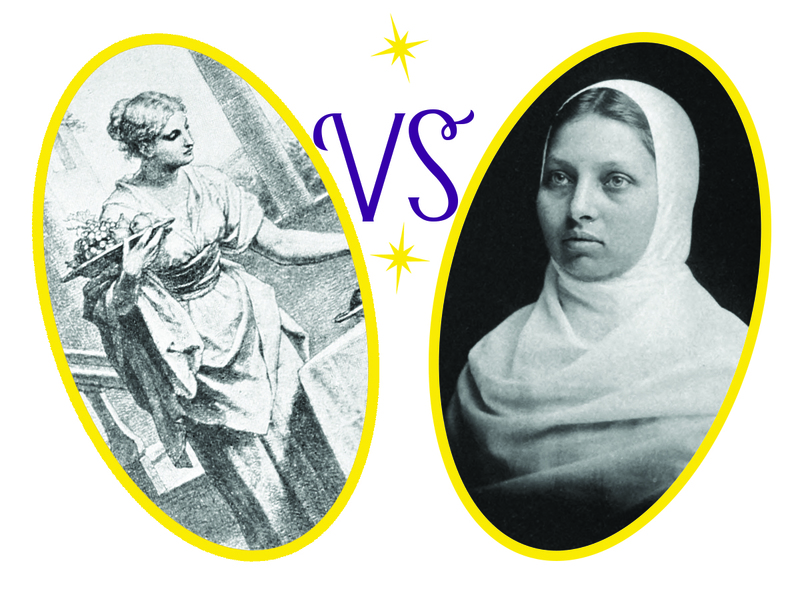 Who will face Martha of Bethany for the Golden Halo? That’s the question for today after Martha stung Gobnait 51% to 49% despite a late swarm (and a whiff of overzealous Gobnait supporters) to reach the Lent Madness Championship round. To get to this point, Zenaida took down Apollonia, Nicholas of Myra, and John Chrysostom, while Pandita defeated Damien of Molokai, Marguerite d’Youville, and William Wilberforce. Whoever wins, the Golden Halo will be decided on Spy Wednesday, with the results announced at 8:00 am Eastern Time on Maundy Thursday. The end is near! Oh, and if for some crazy set of circumstances, you missed yesterday’s final in-season episode of Monday Madness featuring our first-ever in studio guest, make sure to catch it here. Yesterday in a hotly contested matchup for the third spot in the Faithful Four, Gobnait stung Ignatius of Loyola 51% to 49%. She joins Martha of Bethany and Pandita Ramabai in the rarified air of Lent Madness 2019.
Who will make the Faithful Four the quartet to which it’s called? We’ll find out in the next 24 hours as John Chrysostom faces off against Zenaida for the final spot. To make it this far, John defeated Margaret of Cortona and Marina the Monk, while Zenaida took down Apollonia and Nicholas of Myra. Then take a deep cleansing breath and get ready for the last three battles of Lent Madness 2019. On Monday and Tuesday it’s the Faithful Four. And then on Spy Wednesday the scene will be set as we collectively crown the Golden Halo winner. The end is near!